From east to west, our discussion covered, first of all, Byres Road, which is currently being considered for redevelopment. Martin is concerned at the lack of ambition being shown in the current Glasgow City Council proposals. We have thus put him in touch with the GoBike grouping that is developing alternative proposals, see: https://space4peoplebyresroad.wordpress.com/2017/10/20/our-vision/ and the photo at the top of this blog is option 2 showing local access and a bus route with cycle lanes both sides. Remember that there’s a ride-out tomorrow along the route – details in the link. Our next point of discussion was the lack of access into Dowanhill for bikes from Highburgh Road. 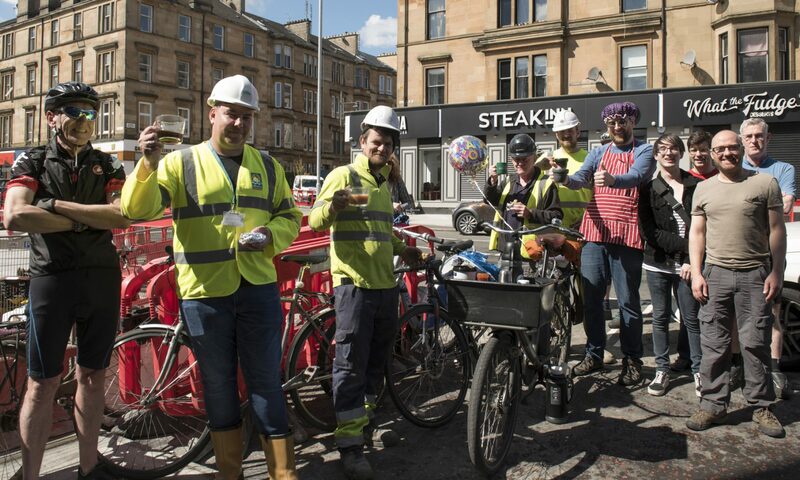 Caledon Street, Dowanhill Street, Beaumont Gate and Hyndland Street are all one-way southwards with no exception for cycles and the only legal option is to turn right into Crown Road South – which is on a bend, and it’s a busy road. Contraflow cycling on one-way streets is the default position in Cycling by Design (clause 5.i.5), the City Council’s chosen design guide, so why doesn’t it apply here, where there is a toucan crossing to aid the passage of people with bikes up Dowanhill Street? It should also be noted that contraflow cycling would reduce traffic speeds on these streets. Third, we noted the good intention of providing disabled parking bays, also noted on our walking tour with Councillors Kenny McLean and Martin Rhodes, which extend right out to the cycle lane – potentially increasing the number of disabled people in the area! Fourth, we looked at the buildout at the end of the row of shops on Hyndland Road. The eastbound painted cycle lane, missing since the junction with Clarence Drive, reappears here, right on the bend and just at the pinch point where the road is at its narrowest. The buildout has been put in place apparently to provide 2 loading bays, which are being misused as parking bays – just where the cycle lane could have been. Fifth, we noted the blockage in the access provided to Prince Albert Road; why is no action taken against parking at all these cycle accesses? Sixth, we discussed the potential of access via Hughenden Lane to the sports facilities and Gartnavel Hospital and points further west. Seventh, we looked at the junction of Hyndland Road with Great Western Road, a scene of constant red-light jumping by cars and constant misuse of the left-turning lane to go straight on to Clevedon Road. Why is no action taken to remedy this? A further point of discussion was the type of cycle facility needed to encourage cycling. While a segregated cycle lane is needed on either side of Great Western Road, which is a major route into the city, a two-way segregated cycle lane would be far better than the current position on Hyndland/Highburgh Road if the Council persists in allowing the storage of private property (colloquially known as car parking) on the road but reduces it to one side only.